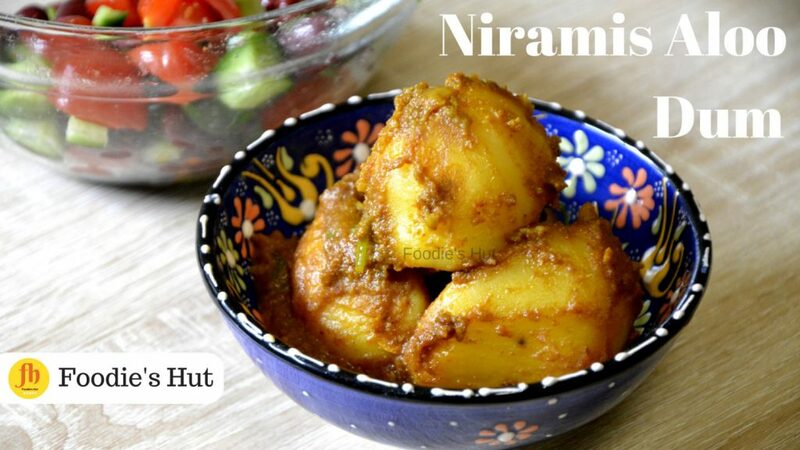 Bengali Niramish Aloor Dum recipe is a part sattvic diet(Niramish), that means no onion and garlic added to the dish. This is a spicy, aromatic potato curry for your vegetarian menu. Whether you are vegetarian or trying to include more meatless or vegetarian meals on your weekly meal plan, this recipe is a keeper. You can enjoy the dish with, Luchi, Paratha, Basanti Pulao, simple handmade Roti, Karaishutir Kochuri, I can go on and on! This can be accompanied in lunch thali for meatless Monday! Like below with Masala Dalia, baby cucumber, sweet berry truss tomato and red kidney bean salad! A soul-satisfying meal packed with flavours and colours! You know me, I love my prep ahead dishes, I make them once in a week and eat twice, thrice throughout the week, and this dish is one of them. Do you like recipes like this? then make a big batch of this. Here is my Bengali Aloor Dom recipe, I hope you love this recipe as much as I do, and when you recreate, don’t forget to tag me #foodieshut! In a mixing bowl, add ginger paste, tomato paste, ground red chilli, ground cumin, ground turmeric, half of the oil, salt to taste boiled potatoes and mix well. After that cover with plastic wrap, allow marinating for at least 30 minutes. Heat rest of the Oil, over medium-high heat. Add all tempering, stir for 5 to 10 seconds to release flavor from whole spices. Add marinated Potatoes, cook over high heat for few minutes, then bring temperature up to lowest point of the stove, add little bit water, cover and allow spices to cook (this process call Koshano or bhuna) for 4-5 minutes or until oil releasing from mixture. Cover with lid and remove from heat. Also, give a little bit standing time to set everything before serve. Enjoy this aloo dum with any type of Bread!